Timor-Leste is located in Southeast Asia, in the East of the Indonesian archipelago and to the North-West of Australia. Commonly known in English as East Timor, the nation comprises the eastern half of Timor Island, along with the enclave of Oecusse in Indonesian West Timor, the island of Ataúro directly facing Dili, and the islet of Jaco at the Eastern tip of the island. While Timor-Leste is comparably small at just 15,000 square kilometres, the island is extremely mountainous. The highest peak is Mount Ramelau at nearly 3000 metres with much of the rest of the country mountainous, though there are various extensive plateaus. Much of Timor-Leste experiences distinct wet and dry seasons, and the vegetation varies from tropical through to semi-arid. The population of Timor-Leste is now just over one million people. While the largest concentration of the population is found in the capital of Dili, the majority of the population live either in regional centres or rural communities across the nation's 13 districts. The official languages of Timor-Leste are Tetun and Portuguese while Indonesian and English are designated as working languages. However, much of the population does not speak either Tetun or Portuguese as a 'mother tongue', and there are more than 30 languages used across the territory with some of the larger language groups being Bunak, Kemak, Makasai and Mambai. In regards to religion, the vast majority of the population are Catholic (over 90 per cent), with small populations of Muslims, Protestants and Hindus. Such religious expression exists alongside animist beliefs, either finding expression outside of the formal religious orders or in synchronistic relationship with them. The colonial history of Timor can be traced back to the early sixteenth century, with Dutch and Portuguese traders and missionaries making their first contact with the island. This contact gradually increased over the following century and the Portuguese sought to consolidate their control over the territory, exploiting natural resources such as sandalwood. However, it wasn't until the mid-nineteenth century that Portugal and the Netherlands began to negotiate the division of the island between them, with a final territorial delineation concluded at the turn of the twentieth century. The Portuguese controlled the Eastern end of the island and the enclave of Oecusse, while the Dutch controlled West Timor along with much of the remainder of the archipelago. During World War Two Portuguese Timor was invaded by imperial Japan, an occupation which lasted from 1942 until 1945. Many tens of thousands of Timorese were killed during the occupation, not least due to the vital support Timorese gave to the small number of Australian soldiers who sought to stymie the southwards advance of the Japanese. Portugal resumed control over the territory shortly after Japan's defeat in World War Two. While the Netherlands relinquished West Timor to the newly formed Republic of Indonesia in 1949, it would not be until 1974, that the Portuguese would begin to withdraw from its colonies, including Timor. In the power vacuum that followed, a brief yet bloody civil war broke out in August of 1975 between the Revolutionary Front for an Independent East Timor (Fretilin) and the Timorese Democratic Union Party (UDT), with Fretilin asserting its dominance over the territory in the following months. After a series of preliminary cross-border attacks, and nine days after Fretilin's declaration of national independence for East Timor, the Indonesian military launched a full scale invasion in an attempt to force the integration of the territory into the Republic of Indonesia. On 22 December 1975 the United Nations Security Council called for Indonesia to withdraw from the territory, yet Indonesia refused the demand and subsequent such attempts to end its occupation. The occupation by Indonesia was characterised by brutal military oppression, mass internal migration, sexual abuse and forced starvation. The most extensive research has indicated that during the occupation the minimum numbers of people killed numbered just over 100,000, with possibly as many as 186,000 people killed due to violence, starvation and illness caused by the occupation. Over the 24 years of occupation, thousands of survivors were subjected to a range of human rights abuses, from displacement to sexual abuse, detainment and torture. Resistance continued to oppose the attempts to forcibly integrateTimor Timur, as the territory became known, into Indonesia. The Armed Forces for the National Liberation of East Timor (FALANTIL), mounted an enduring guerrilla war, typically using the mountainous terrain as the base for its activities. The November 1991 Santa Cruz Massacre, caught on video and televised around the world, provided testament to an increasingly active youth clandestine front, particularly in urban centres. While the massacre was a major set back for the clandestino, the combination of growing political activities by youth, in tandem with persistent guerrilla activity and an international campaign, meant that over the 1990s pressure was continuously applied to the Indonesian regime. With massive political upheaval in Indonesia across the late 1990s the long-serving President Suharto resigned in June 1998. The new President, B.J. Habibie, announced in January 1999 that a referendum would be held for the East Timorese people to decide between autonomy within Indonesia or full independence. Subsequently the United Nations Assistance Mission for East Timor (UNAMET) was established to oversee the referendum process. In the months leading up to the event, pro-Jakarta militias were formed in collusion with the Indonesian military across East Timor. Their formation was part of a plan to intimidate the local population into voting against independence and an attempt to portray the conflict as intra-Timorese. With massacres in places such as Liquiça, and a general escalation of violence across the territory the vote was postponed until 30 August. Despite the ongoing intimidation, on 4 September 1999 it was announced that 98.6 per cent of registered voters had cast a ballot in the referendum, with an overwhelming 78 per cent voting for independence. The vote for independence triggered a campaign of massacre and destruction by the Indonesian military and their supporting militias. During this period approximately 1,300 East Timorese were killed and 300,000 were forced to flee as refugees, especially to West Timor. Much of East Timor's infrastructure was looted and destroyed, with nearly three quarters of all buildings in the territory, including homes, schools, public buildings and markets, either severely damaged or totally wrecked. On 20 September a United Nations-mandated Australian-led peacekeeping force entered Dili as the International Force for East Timor (INTERFET). On 25 October 1999, the United Nations Transitional Administration in Timor-Leste (UNTAET) was created to take responsibility for the transition of the territory into independence. Elections were held on 30 August 2001 to select representatives to determine the Nation's Constitution. In effect, this Constitutive Assembly turned itself into East Timor's first Parliament to serve a five-year term, assuming power on May 20 2002, the day full and formal independence was celebrated. Fretilin formed government and was led by Mari Alkatiri, and Xanana Gusmão became the nation's first president. UNTAET was succeeded by the United Nations Mission of Support in East Timor (UNMISET), which itself was replaced by the United Nations Office in Timor-Leste (UNOTIL) in March 2005, following the withdrawal of peacekeeping forces . With allegations of corruption and mismanagement, and unresolved tensions over land and property, various expressions of social unrest. In 2002 youth demonstrations led to the burning of the Prime Minister's house; in 2004 former combatants protested against the government's failed attempts to recognise their service; and in 2005 the Catholic Church mobilised many thousands of protesters against the government, ostensibly over education curriculum. The most serious upheaval, however, began in 2006 in a period that would come to be termed the ‘crisis’. In January 2006, a group of dissenting members of the East Timorese military (F-FDTL) issued a petition to political authorities, claiming poor work conditions and discrimination within the ranks of the military against those from the Western districts of Timor-Leste. Over the coming months, the original group of petitioners, led by Lt. Gastao Salsinha, were joined by hundreds more soldiers, who deserted their posts in protest. Tensions escalated in mid-March when, following calls made by Prime Minister Mari Alkatiri, the chief of the F-FDTL Taur Matan Ruak dismissed the petitioners; 594 soldiers, accounting for some third of the F-FDTL, were discharged from the military. Public demonstrations and street confrontations took an increasingly violent and polarised character, inflamed by speeches made by President Gusmão that seemed to legitimise the East-West division, and by the ongoing dissatisfaction with the FRETILIN government. Following a protest of petitioners and anti-government sympathisers on 28 April, members of the F-FDTL and PNTL fired into crowds and engaged in gun battles on the outskirts of Dili, resulting in five deaths and dozens of injuries. In apparent response to the actions of the F-FDTL and in anger at the government, Senior Military Police Officer Major Alfredo Alves Reinado deserted his post with the Military Police, accompanied by a number of heavily armed members of his unit and the PNTL riot squad. Armed confrontations continued in and around Dili, instigated by Reinado and Salsinha’s petitioners, the divided state security apparatus, and a growing number of gangs. The emergence of these gangs, based to a significant extent on division between Lorosa’e (the East of Timor-Leste), and Loromonu (the West of Timor-Leste), was later found to have been in part supported by some members of the defence force and parliament, who provided funds and weapons. In late May, a massacre of PNTL officers, violent assaults on and by political leaders and a complete security vacuum in Dili prompted the renewal of the UNOTIL mandate and a request for a new Australian-led peacekeeping force. Under sustained international and domestic pressure, events ultimately led to the reluctant resignation of Prime Minister Mari Alkatiri in late June. As a consequence of the pervasive insecurity in Dili, by this time there were some 150,000 internally displaced persons (IDPs) staying in informal camps throughout Timor-Leste, making up approximately 15 per cent of the nation’s population. In August a new peace-building mission, United Nations Integrated Mission in Timor-Leste (UNMIT) was initiated, with a major focus on security sector reform. 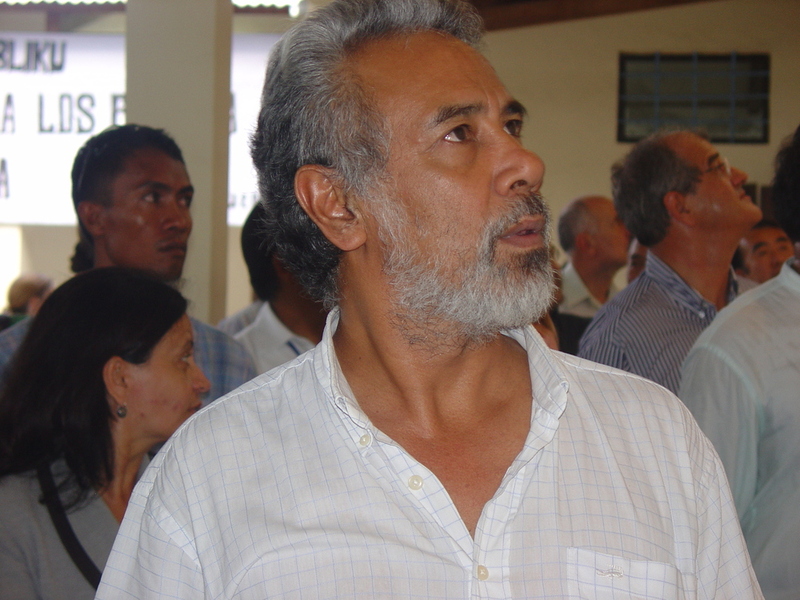 Violence continued intermittently throughout the remainder of 2006 and 2007, notably in a response to outcomes of the national elections, which saw Jose Ramos-Horta win the position of President and Xanana Gusmão’s newly formed party Congresso Nacional da Reconstrução Timorense (CNRT) form a parliamentary alliance that outed the FRETILIN party from power. Insecurity was further prolonged by the ongoing evasion of Reinado and his rebel group, who had been pursued by East Timorese and international security forces following a series of violent incidents and a jail breakout. After numerous confrontations with security units, on 11 February 2008 Reinado’s life came to an end during what was reported to be a failed assassination attempt by his group on Prime Minister Gusmão and President Jose Ramos Horta. Ramos-Horta was shot and almost died during these events; however there is still much uncertainty over events of the day. Over the coming months the remaining petitioners surrendered and many were reintegrated into the F-FDTL. Compensation was made by the Government to veterans and IDPs, to alleviate tensions and encourage return to some state of normal living. The events during the crisis revealed and amplified deep rifts within the East Timorese political landscape, manifest in divisions of loyalty and shifting allegiances between politicians and leaders of Timor-Leste’s security apparatus. Nonetheless, the CNRT-led government has since managed to secure a degree of stability, in part via its willingness to access and utilise financial resources from the Timor-Leste Petroleum Fund. Much hope had been placed in the potential tax revenue derived from oil and gas in the Timor Sea, the subject of long and acrimonious negotiations with Australia regarding a maritime treaty. The economic impacts of the increased access to the Petroleum Fund are showing mixed results; roads and electricity transmission lines mark the physical landscape, but are tainted by complaints of dubious quality, corruption, and nepotism in the awarding of contracts. The threats of the so-called ‘resource curse’ are alluded to by the visible polarisation of the majority East Timorese population, dependent on subsistence farming, and an elite who drive imported sports cars and shop at the recently opened US-style mall, Timor Plaza. The crisis of 2006-08 had reignited domestic and international fears of recidivism into the chaos and destruction marked by the withdrawal of Indonesian security forces and their proxy militias after the vote for autonomy in August 1999. It demonstrated in the most dramatic fashion the many difficulties that Timor-Leste faces as it continues the process of nation-building. In 2012, the passing of both Presidential (won by former defence chief Taur Matan Ruak) and Parliamentary elections (which saw CNRT again form a winning coalition) with little occurrence of violence, and the subsequent withdrawal of the international peacekeeping forces and end of UNMIT’s mandate, seemed to signal a new period of independence and stability. However as the international spotlight on the nation fades, it must be noted that contemporary Timor-Leste continues to face many of the challenges that preceded the crisis. Impoverishment, unemployment, deficient and non-existent social services, low standards of living and literacy, and poor general and maternal health, have all endured and are common experiences for a great many East Timorese. Questions remain as to how long the Petroleum Funds can hold out for, how substantive the investments purchased by the funds are, and how well the nation can construct a future that encompasses all East Timorese, so as to overcome social, political and material divisions. Language remains a contentious point of debate in Timor-Leste. In terms of the numbers of languages and dialects spoken, different estimates often range from 15 to more than 40. The figure here is simply based on the 2004 Census, which listed nearly 40 languages spoken, including a category for 'other'. John Taylor uses the figure of 60,000 as a total estimate of the number of Timorese killed during the Japanese occupation. See John G. Taylor, Indonesia's Forgotten War: The hidden history of East Timor, Zed, London, 1991. Chega! The Report of the Commission for Reception, Truth, and Reconciliation Timor-Leste, Draft Copy, October 2005, p. 44 and p. 77. For instance, the Executive Summary explains that "The Commission estimates that the minimum figure for the number of conflict-related deaths during the Commission's reference period, 1974-1999, is 102,800 (+/- 12,000). This estimate is derived from (i) an estimated 18,600 total killings (+/-1000) using multiple systems estimation (MSE) techniques and (ii) an estimate of 84,200 (+/- 11,000) deaths due to hunger and illness which exceed the total that would be expected if the death rate due to hunger and illness had continued as it was in the pre-invasion peacetime period."Chega! The Report of the Commission for Reception, Truth, and Reconciliation Timor-Leste, Draft Copy, October 2005, p. 44.